I recently took my family to the Iowa State Historical Museum in Des Moines. The quote below was placed on the wall near the exhibits about the early days of settlement of the state. Iowa in the 1830s was part of what was referred to as Wisconsin Territory. Seeking opportunities is a fundamental part of America’s history, and farming has had a central role in that history. In the nineteenth century huge tracts of productive farmland in states like Iowa were opened to those who were willing to settle the country. People like Aristarchus Cone came to Iowa in the 1830s when there was very little waiting; few, if any, established governments, towns, roads, and railroads. 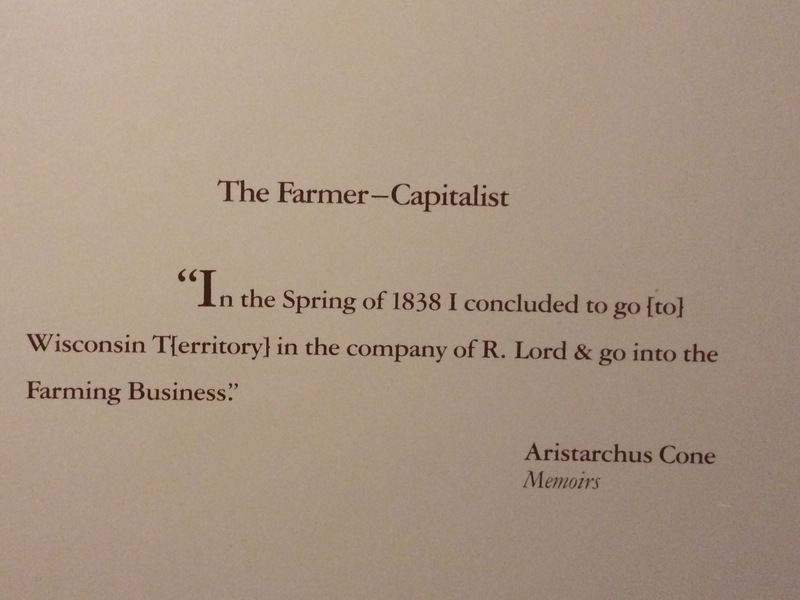 Therefore, farming was both necessity and opportunity. Establish food and shelter for your family and then work as settlement occurs over time to develop commercial production. Early settlers forged lives from what the country could offer and built farms, businesses, towns, and states in the spirit of pursuing opportunities. The virtuous basics of free enterprise took hold – work/produce, save, invest – and each generation was better off to pursue their own opportunities whether in farming or something else. In the twenty first century in America there is no more homestead land for those who want to ‘go into the farming business.’ However, there are still ample opportunities for the farmer entrepreneur. Instead of just arising from earth’s resources, today’s farming opportunities arise from a limitless source, human imagination. Niche products – Arronia berry products at Sawmill Hollow Farm, Berkshire pork from Berkwood Farms, and Wagyu beef from Majinola Meats are just three examples of consumer-facing products from farmer entrepreneurs. Technology-enabled production models – Butter lettuce from Leaf Safari, barramundi from Iowa’s First, or shrimp from Shrimp 59. All these products are available from other places in ample supply, but farmer entrepreneurs for each of these businesses make their products available in new places using technology to create new production models. Innovative business models – A farmer entrepreneur from Iowa I visited with recently shared a business model strategy underway for his operation. He purchased farmland to develop recently. This is nothing different from what he has done in the past to become a 10,000 acre+ farm in Iowa. What is different about his recent purchase, however, is that it is 1,500 miles southeast of Iowa. He is planning to ship some equipment from Iowa and part of his labor force south to work in the winter at improving the land that he thinks is undervalued as cropland relative to the Midwest. Perhaps just land arbitrage, but also potentially the beginnings of development of an innovative new business model for his farm operation. Global agriculture development – Technology from the U.S. can make a difference across the globe, but the most important ingredient American agriculturalists can add is know-how. Farmer entrepreneurs from the U.S. continue to find interesting new ways to use their experience and talent in parts of the world that need them. Stevenson Angus Ranch in Russia and Full Circle Global Ag in Ghana are two examples of farmer entrepreneurs involved in transformative agricultural development projects in places dotting the globe. Two of the most popular search terms that bring visitors to this website, a majority from outside the U.S., are ‘farmer entrepreneur’ and ‘agricultural entrepreneur.’ It’s been 180 years since farmer entrepreneurs first settled the part of the world where I live, Iowa, but the idea remains firmly of interest to people here and many across the globe.